Returning to my roots as a minimalist lighting expert. I did write the book about it, after all. Stuff to put into the Think Tank Airport Security case tonight for tomorrow's shoot. my trusty Sekonic light meter. Out of the blue, about a month ago, I got a nice note from someone at the company that makes Cactus products and he offered to send me some of their products to test. I thought about it for a couple of days because I've found extended loans of cameras for the purpose of reviewing has the effect of making me subconsciously feel that I should alter my approach to photography by learning a new, different, weird interface or menu or handling characteristic. Also, when testing cameras you tend to become locked into whatever lens the camera company might send you. Would I enjoy testing an Olympus camera if the company was hellbent on sending me only a 14-42mm kit lens? No! I would not. Did I enjoy working with the Samsung NX-1 and the lesser kit lens? Not really. So the camera you use is an essential driver. Do I feel the same way about lighting? No really. I think of flashes as more or less interchangeable as far as the light they put out and the way they handle. For most work I am a manual setting user and not a TTL geek user. I don't spend a lot of time figuring out every little way a flash could work and I don't like to leave the metering of multiple light set ups to the camera or flash's discretion. A flash is a flash is a flash. If they put out the same power and they recycle quickly then I'm pretty happy. I decided that I could compartmentalize the way I work with lights and I decided not to try and press the test gear into every shoot. And I further promised myself that I wouldn't change the way I work just to investigate features that I might never want to use in real life. With that all in mind I sent back an e-mail and agreed to accept and test the gear. A couple weeks later I got a box from Fed Ex that came all the way from Hong Kong. Inside the box, and beautifully packaged, were three Cactus V6 Wireless Flash Transceivers and one Cactus RF60 Wireless flash. I pulled out the user manuals and started reading. The transceivers are radio triggers; they can be used on camera as a master to trigger other transceivers or they can be used as slaves to trigger attached flashes. The transceivers are set up with 16 channels and four groups. A master can control certain flashes by changing their power levels. 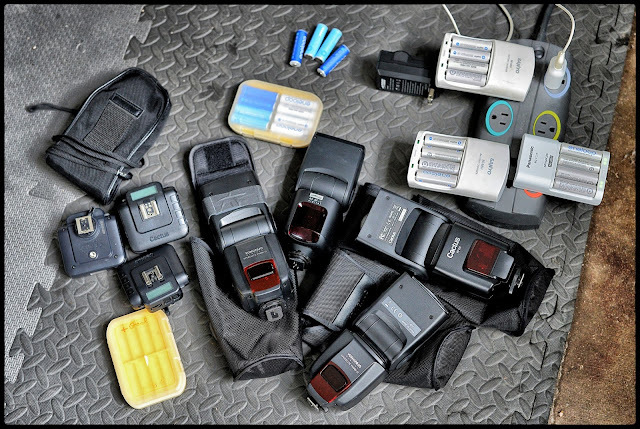 The transceivers are programmed with some of the most popular Nikon and Canon flash profiles and they control the flash power levels through hotshoe contact communication. You can change power levels separately for each group of flashes and transceivers. So far so good. For my uses I can stop right there. I can put one of the V6's on the camera and use the other two V6's to trigger attached flashes. I can also trigger the RF60 flash with a V6 on the camera. And that's mostly the way I end up using my flashes for most work. I am so old school with this stuff. I want to set the levels on the flashes and make a test frame---then adjust. But the V6s can do more. You can assign each V6 a channel and you can enable or disable each channel or any combination of channels from the master in the hot shoe. Wanna see what one set of lights looks like? Turn off the other channels and blaze away. With approved flashes (Nikon users will find SB-800, SB-900 and SB-910s on the list) you can increase or decrease the manual power level for each group. That means if I use the RF60 flash as a master and hook up three compatible flashes on three V6s, and then assign different channel for every V6 I can, from camera, control the power levels of all three slaved flashes from the camera location, individually. Nice. If you are using a compatible TTL flash (say an SB-900) you can put the SB-900 in the V6's flash shoe and take advantage of their TTL "passthrough." Your flash will communicate directly with the camera in the normal TTL mode with all the usual stuff and you will still be able to trigger and control flashes connected to other V6s remotely. There's one more thing about the V6s that's pretty cool but I haven't played with yet and that's the ability of the transceivers to "learn" new flashes. Someday soon I'll get around to writing about it but for right now I'll just extol the virtues of the V6s. They work. They are easy to set up. The flash shoe on the unit is a great flash interface. I like that the V6s take two double A batteries. I used the V6s as triggers pretty extensively while I was shooting the annual report project for a public utility back in April. I used them indoors in industrial spaces, and outdoors in electrical substations and they never failed to trigger. Using the battery powered flashes and the transceivers on several recent jobs that required moving quickly and setting up and tearing down just enough stuff to get the job done reminded me that I've been so intrigued by new technologies like LEDs that I'd skirted using the tried and true tech like flash for too long. Practically speaking, this is the stuff we learned on and it's like riding a bicycle--you really don't forget how to set up and execute with flash. I'm packing up to do a shoot tomorrow and I was looking through the light inventory trying to decide what to use. My first thoughts were about LED panels because there is a certain charm in continuous lighting but then I thought about how easy the job would be with a Think Tank rolling case full of shoe mount flashes and I decided to go all in on that methodology. I'm only taking four flash units. Two are inexpensive Yongnuo flashes, one is the Cactus RF60 and the third is a Metz flash. The Yongnuo flashes have built in optical slaves while the Cactus and the Metz require external triggers. I'll take along a bunch of Eneloop batteries, a small softbox and a few collapsible Westcott umbrellas and I should be set. We're going to attempt to make portraits on location with very, very shallow depth of field. I can't use the ambient light. I scouted it yesterday and it's not photography friendly. It's all ceiling fixtures with florescent tubes. Not pretty tubes either. I want to bring lights to leverage the ability to create light direction and light quality as well as color purity. I chose the flashes over LEDs in case I want to shoot with windows in the background. A couple of stout flashes and some sunscreens over the windows gives me more than a fighting chance at overpowering or matching existing exterior light. Especially with the cloudy weather we're having lately. The beauty of this plan is that everything; cameras and flashes, will fit in one case with wheels. A bag of small, light stands is the only other luggage I'll need to get through an entire day or portrait shooting. But it's not like this is all new to me. I did actually write a bestselling book about lighting with small lights. It's a bit dated now but I think it's still a good read and the foundational concepts are still right on the money even if the gear has changed a bit. Here's a link to my very first technical book on photography: Minimalist Lighting. And yes, it's still in print!